Yesterday we looked at the Vairy 8, a casting whose rear 8-cylinder crate engine plays a huge role in the casting’s overall character. Today we look at another rear 8-cylinder crate engine casting that was originally introduced in the 2003 First Editions, the 8 Crate. While this version is from the Hot Wheels Classics Series 5 (2009), the 8 Crate introduction via the 2003 First Editions was a pleasant surprise. Back before we had Malaysian factory workers posting horrible resolution pictures of castings fresh off the assembly line, Hot Wheels releases were a mystery until they were found at the retailer. The 8 Crate was part of a list of announced 2003 First Editions. As is the case for other unlicensed Hot Wheels designs, “8 Crate” could have been anything. 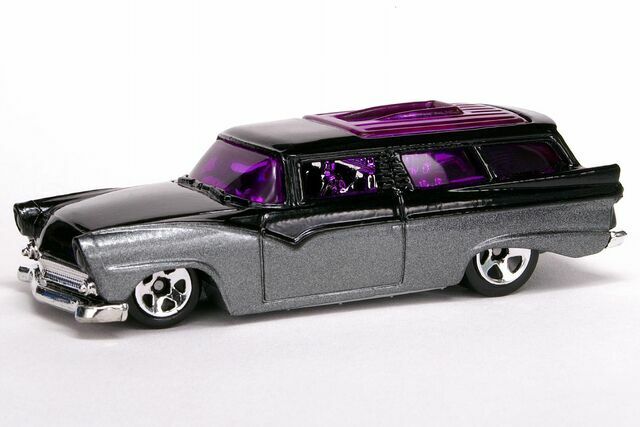 So when the First Edition starting showing up, many collectors and “car-guys” alike were ecstatic that this unlicensed release was based off of a 1950s Ford Wagon. Fast-forward to 2009, the Classics line was in its 5th year. Series 4 didn’t fly off of the shelves the way 1 through 3 did. Hot Wheels decided to spice up the line with sure-fire hits like the Texas Drive ‘Em and the Convoy Custom while also introducing the “chase” element to the line. Collectors responded by snatching up Series 5 releases quickly. Unfortunately, retailers had already begun dropping the line, carrying less and less stock. Most, if not all of the line was released but the numbers just weren’t there, making Series 5 pretty hard to find, especially if you were looking for one of the castings in the series. As a collector of the 8 Crate casting, I searched high and low for all 6 releases of the 8 Crate (3 colors, each with 2 different sets of wheels). I only found the chrome (regular) version. I ended up trading away the Texas Drive ‘Em (copper version) and Custom Convoy (blue version) I found to get some of the 8 Crates I couldn’t find, including this beauty I leave you with. RELEASE DETAILS: Spectraflame Green Body (metal). Dark-Tinted Windows. Chrome Interior. Chrome Real Rider 6-Spoke (RR6SP) Wheels with Redlines. Unpainted Metal Base. Made in Thailand. Toy# N6955. Released in 2009 as part of the Hot Wheels Classics line. This version is considered to be a “chase” piece meaning it came in more limited quantities than the common version that had 5-Spoke (5SP) Wheels with Redlines.